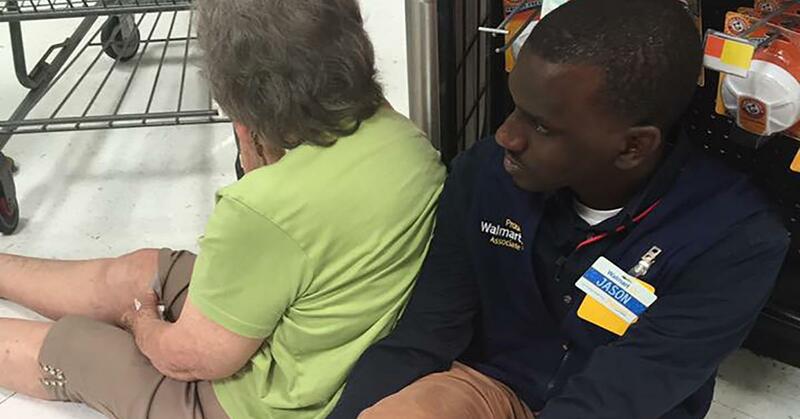 Brittany McKee, a nurse from Appling, Georgia, was shopping at Walmart on Thursday when she spotted a woman passed out on the floor. Her Facebook post detailing what happened next has gone viral, picking up more than 135,000 shares and 300,000 likes in less than a day. "Following my appointment this morning to check on our growing baby boy, my husband and I stopped at Walmart in Evans to pick up a couple of things." "As we were walking to the refrigerated section, we noticed a woman who had passed out and fallen on the floor. Being a registered nurse, my first instinct was of course to stop, assess, and be there to help. She had regained orientation, but did say she was on blood thinners and felt dizzy." "So I stayed with her, along with her daughter and the Walmart personnel, until the ambulance came and tried to encourage her to stay seated. The Walmart staff was amazing. They kept in contact with dispatch as we waited on the bus to arrive." "Then there was Jason. I don't know his last name, but this man, no questions asked got down on the floor with this woman and supported her back so she could lean against him. He literally got down on the floor to serve her, not because he was asked to do it, he wasn't, but because he wanted to." "The media lately shows our country divided, filled with hate and racial tension, but this right here was one human being loving and serving another without condition of race or obligation. While we waited, another man stopped, knelt down and prayed over this woman. What I experienced today was love, kindness, and serving." "We are human beings, each and every one of us regardless of how much pigmentation our skin has or doesn't have. I couldn't help but share because the media doesn't seem to report this... the unity and the positive that occurs. This right here is real life, this is what it's all about, not hate." WDBJ7 were able to contact manager Jason Lewis, who said that he sat down to support the woman after she lost her balance while trying to get up. Jason says he had no idea Brittany took the picture, and was in a meeting when it started going viral. His wife texted him when the meeting was over and told him to check Facebook. "That's how my parents do it. I just wanted to live a good life and that's just one of the results of it -- being able to render help when it's actually needed," he said. "Thank you for posting, we need to spread good will. God knows the news doesn't. Thank you young man for caring for others. You are inspiring. And Thank you to whoever your role model was, they did a great job." "Doesn't matter what you look like or color, there's good in just about everyone, helping each other is what this is all about. If I see someone that needs help, I will do it."